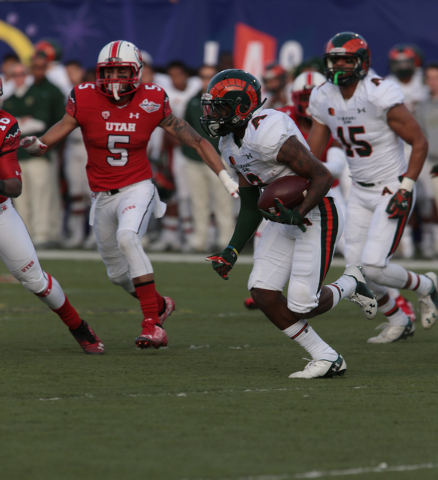 Utah came out strong, scoring three touchdowns in its first 10 plays against Colorado State on Saturday at Sam Boyd Stadium. 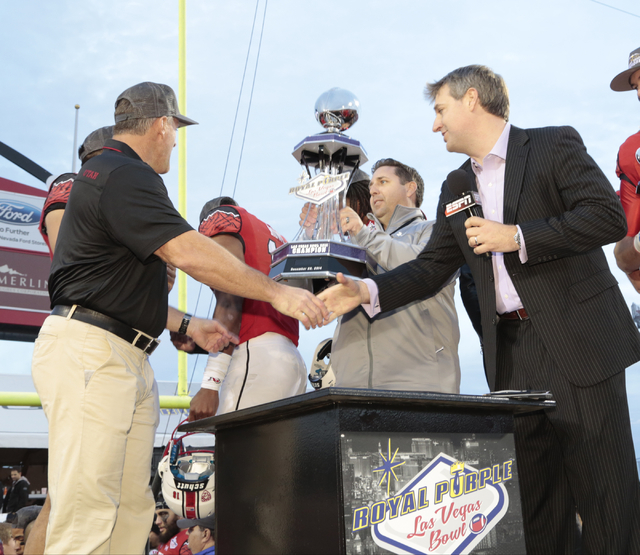 The Utes went on to a 45-10 win in the Royal Purple Las Vegas Bowl. 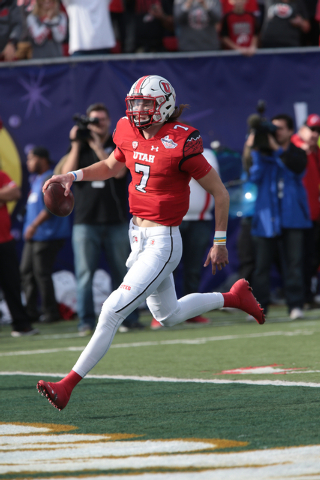 Utah came out so strong, scoring three touchdowns in its first 10 plays, that it looked as if the Utes would be able move at will all Saturday afternoon. They didn’t, but that blazing start set the tone. 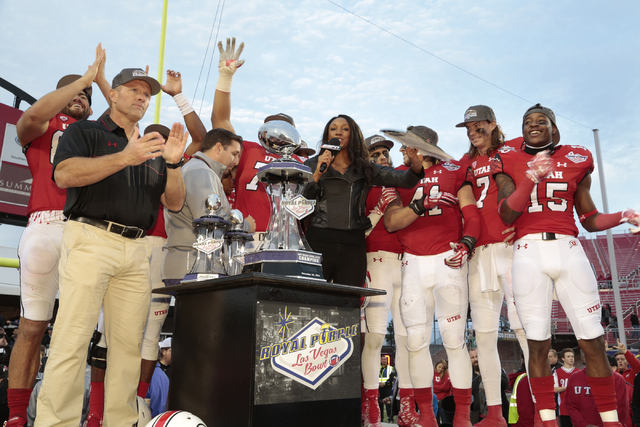 The 23rd-ranked Utes built on that opening quarter and showed they were the better team, blowing out Colorado State 45-10 to win the Las Vegas Bowl. This was the second-largest rout in the bowl’s history, surpassed only by the 55-14 drubbing by Oregon State of New Mexico in 2003. 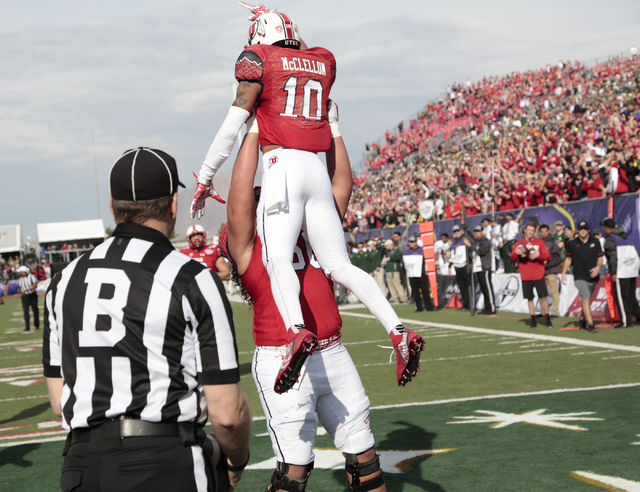 This was the second year in a row the Pac-12 team dominated its Mountain West opponent in this game. Southern California jumped to a 35-6 halftime lead over Fresno State last year and went on to win 45-20. 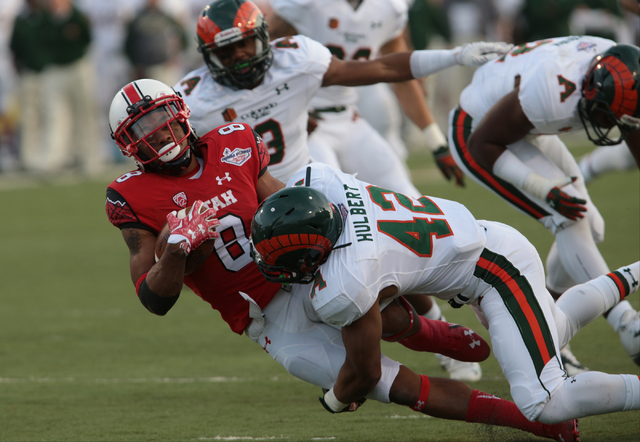 Utah (9-4) didn’t even need the full 30 minutes of a half to grab control against Colorado State (10-3). 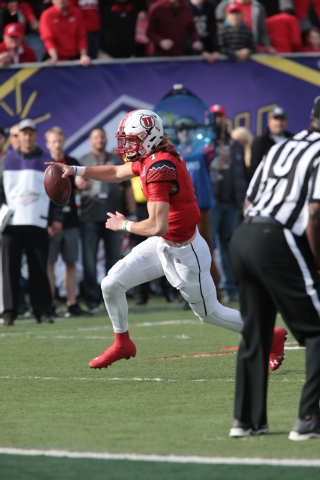 The Utes took a 21-7 lead just 9:30 into the game on an 8-yard touchdown run by quarterback Travis Wilson, a 16-yard TD pass from Wilson to Delshawn McClellon and a 60-yard scoring run by Devontae Booker. 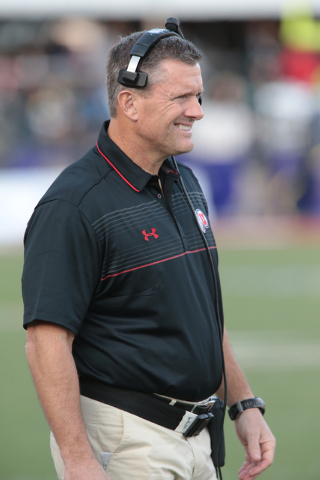 Though Utah didn’t match that offensive prowess the rest of the game, the Utes never allowed the Rams to get within single digits. 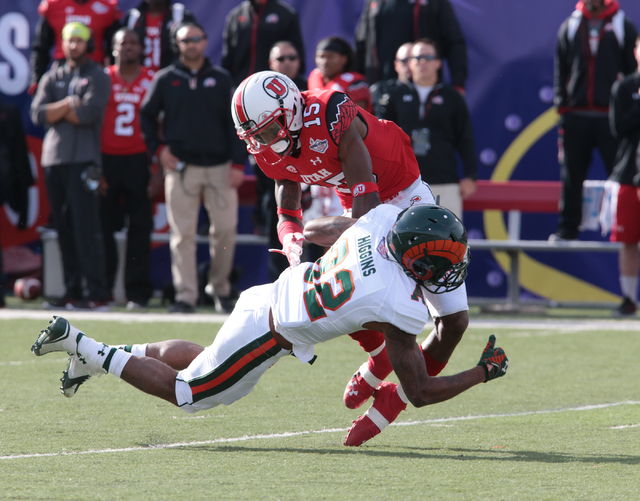 Colorado State’s best chance to make a game of it came early in the third quarter when Rashard Higgins, who made seven receptions for 110 yards, dropped a pass deep in Utes territory that would’ve resulted in at least a first down and maybe a touchdown. A touchdown would’ve brought the Rams within 24-17, but they wound up with zero points when Jared Roberts hooked a 44-yard field goal badly to the left. 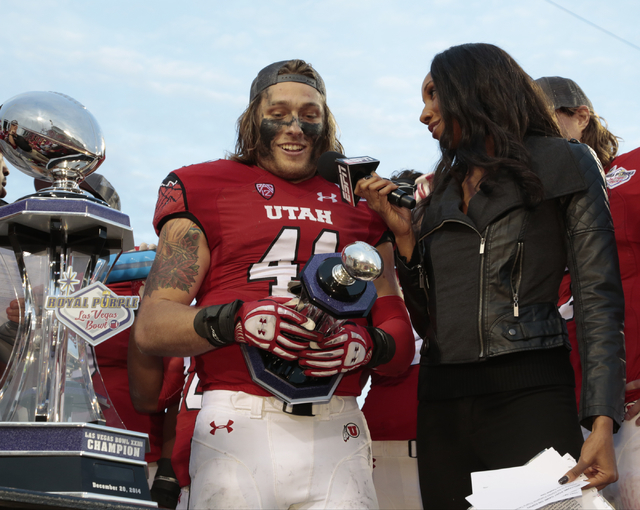 Utah’s Wilson was named the game’s Most Valuable Player after passing for a touchdown and rushing for three. He completed 17 of 26 passes for 158 yards, and gained 91 yards on 11 carries. 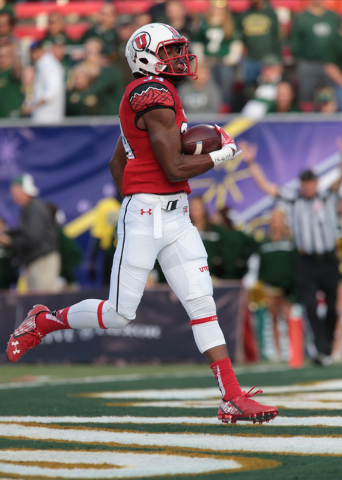 Booker led Utah with 162 yards on 26 rushes, and the Utes totaled 548 yards of offense, including a Las Vegas Bowl-record 359 on the ground. 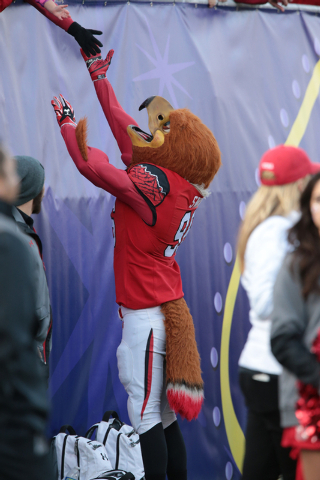 The previous mark also was set by Utah, which ran for 334 yards against Fresno State in 1999. 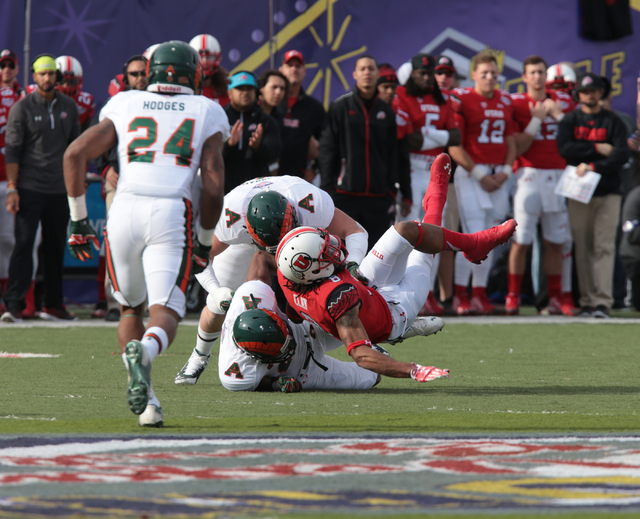 Colorado State’s usual high-powered offense didn’t come close to that production, gaining only 12 yards rushing. 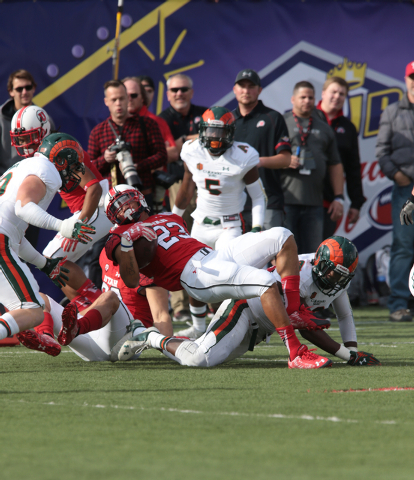 Dee Hart, an Alabama transfer who entered the game with 1,254 yards rushing, gained only 21 on seven carries. 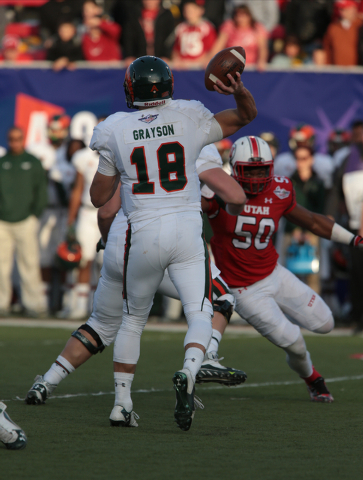 Rams quarterback Garrett Grayson, the Mountain West Offensive Player of the Year, completed 20 of 34 passes for 227 yards, but in the fourth quarter, he fumbled and threw an interception that led to Utah touchdowns. 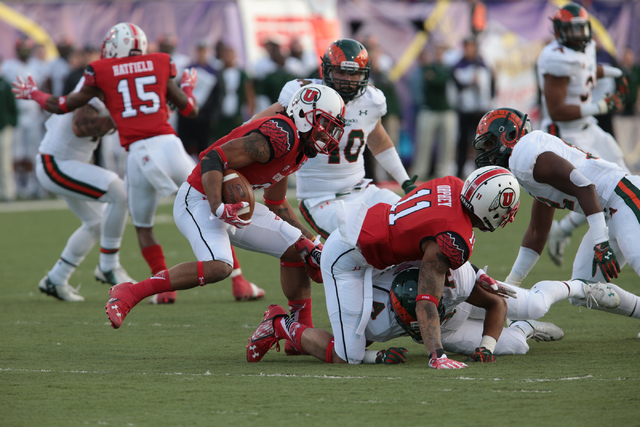 Utah also got to Grayson for three sacks to run their season total to 55, which leads the nation. 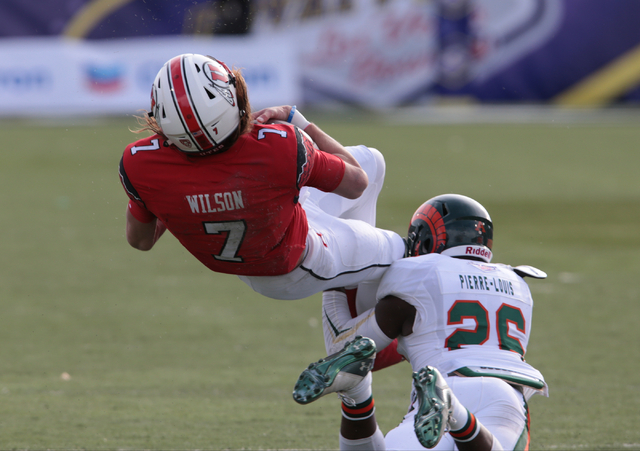 One of those sacks came from rush end Nate Orchard, giving him the national lead with 18½, half a sack more than Washington’s Hau’Oli Kikana. 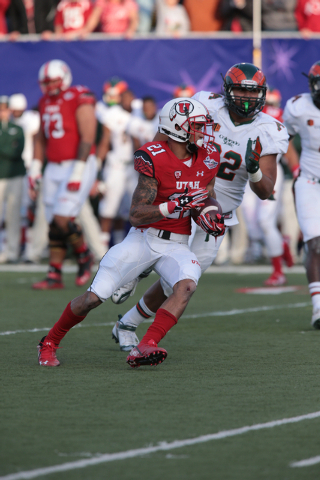 This game was a much more positive experience for the Utes than their previous trip to the Las Vegas Bowl. 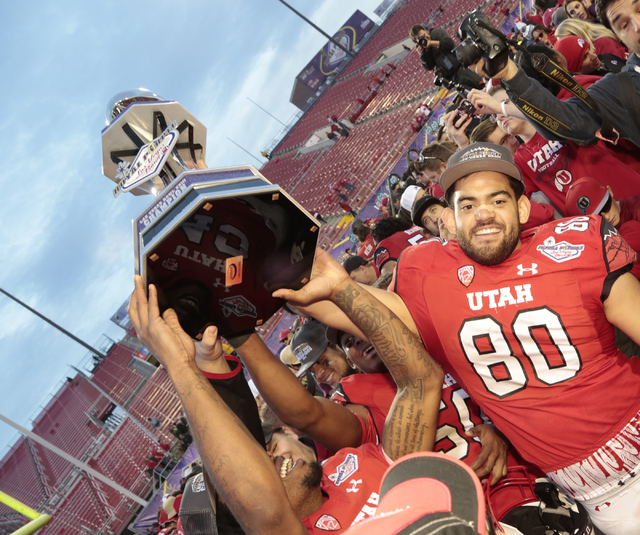 They were beaten 26-3 by Boise State in 2010, but the Utes know how to win bowls. 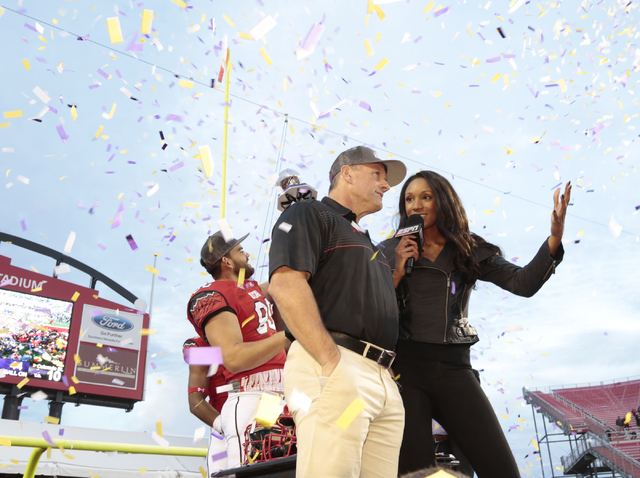 They have won 11 of their past 12 postseason games, and Whittingham’s personal 8-1 record tied former USC and UNLV coach John Robinson for the best winning percentage with at least seven appearances. Robinson also went 8-1 for an 88.9 winning percentage. Colorado State got to this game without coach Jim McElwain, who was hired at Florida after the regular season. Baldwin coached the team on an interim basis, and one of the key questions last week was whether the Rams would be focused. By game day, that question became irrelevant. 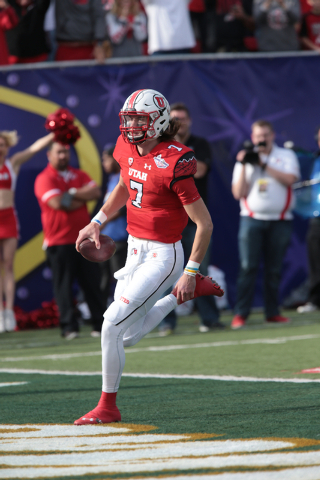 Utah left no doubt which was the better team. 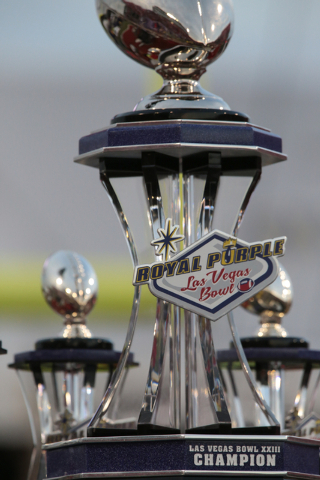 Contact Mark Anderson at manderson@reviewjournal.com or 702-387-2914. Follow him on Twitter: @markanderson65.